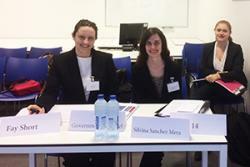 Law students, Fay Short, Silvina Sanchez Mera and Laura Jager (at rear) preparing to compete at the ICC Moot in The Hague.A team of Bangor University Law students have beaten off previous winners and made it through to the semi-finals of a prestigious international competition for law students. This was Bangor University Law School’s first attempt competing in the International Criminal Court (ICC) Moot Court competition. 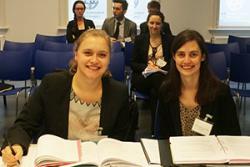 Held at The Hague and organised by Leiden University’s Grotius Centre for International Legal Studies, with the support of the International Criminal Court, the ICC moot is one of the more notable international mooting competitions in which law students compete against each other in simulated court proceedings. Over three days, the Bangor University team of LLM students Silvina Sanchez Mera and Fay Short and final year LLB student Laura Jager, participated in the preliminary rounds of the competition, seeing off competition from Bond University, Australia, who have won the competition twice in the last six years, and teams from Ukraine, Turkey, Bosnia, Germany, Ghana, USA, Kenya, Afghanistan, Switzerland and Malaysia. The competition organisers then announced Bangor University’s team among the highest-ranked teams who would progress to the quarter-finals.